Dr. Jennifer Bossel | Smile Angels of Beverly Hills - Bruce Vafa DDS. Dr. Jennifer Bossel combines cosmetic dentistry expertise and compassionate care at Smile Angels of Beverly Hills. She specializes in bridges, crowns, and veneers that enhance the beauty of her patients’ smiles. She even performs complete smile makeovers so that you can make a dazzling first impression. Dr. Bossel is certified in Invisalign clear aligners and Lumineers veneers. She brings her multilingual skills, world-class education, and altruistic personality to our team. Patients of all nationalities will appreciate Dr. Bossel’s multicultural background. She speaks English, Spanish, French, Arabic, and Hebrew fluently. Her French father and Moroccan mother raised her in Casablanca, Morocco, where she was born. While still a young girl, Dr. Bossel excelled at riding horses including show jumpers. In 2003 and 2004, she won national medals at the Women’s Royal Cup. The dedication involved in training horses prepared her for succeeding at school. When she was 17, Yeshiva University in New York City awarded her a full scholarship. She traveled to America to fulfill her dream of learning the science and art of dentistry. Dr. Bossel graduated on Yeshiva University’s dean’s list with a Bachelor of Arts degree in biology. Then, she attended Florida’s Nova Southeastern University School of Dentistry, where she shined in academics. In the National Board of Dentistry Examination, she scored in the top 10 percentile of the nation. After graduating from dental school, Dr. Bossel went to Brooklyn Hospital Center, where she completed an additional year of advanced residency training. Learning from many real-world cases, she mastered surgical techniques that solved complex dental problems. 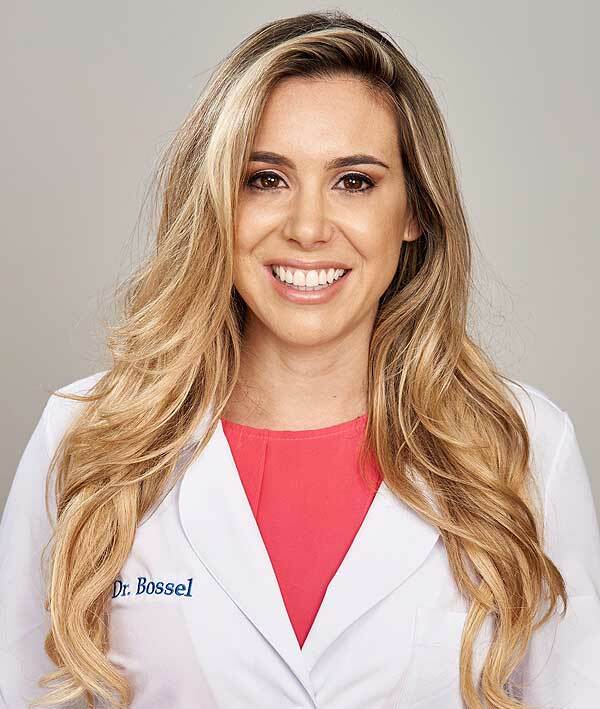 Dr. Bossel’s professional career began in Miami, where she gained several years of experience. Her work included preventive and restorative dentistry such as filling cavities. She also excelled at endodontics to treat the inside of the tooth with root canals. In addition, she developed her talent for cosmetic dentistry and perfected the smiles of her patients. In 2015, after getting engaged to her soul mate, she moved to Los Angeles. With her emphasis on improving smiles through cosmetic dentistry, she was a natural fit for Smile Angels of Beverly Hills. She loves meeting new patients and ensuring that their smiles reflect the warmth of their personalities. Throughout her career, Dr. Bossel has contributed her dental expertise to people who struggle with difficult circumstances. For example, during her residency at Brooklyn Hospital Center, she provided compassionate care to patients in the AIDS clinic. She’s also participated in dental mission trips, offering complimentary treatment to people who otherwise couldn’t afford it. This empathy for others comes through in every patient she treats. When Dr. Bossel isn’t working at Smile Angels of Beverly Hills, she loves spending time with her beloved husband and young daughter. You can also find her Zumba dancing, hiking, traveling, and cooking. Dr. Bossel is a member of the American Academy of Cosmetic Dentistry, the American Dental Association, the California Dental Association, the Florida Dental Association, and the Los Angeles Dental Society.